Please can you tell me the year the HP Deskjet 960c was manufactured please? 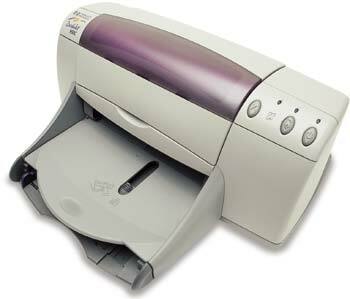 The HP Deskjet 960c printer was first released in March 2001. Please send me a black ink cartridge for my HP Deskjet 950C printer. I already had it in my basket - what happened? I would like this as soon as possible. Thanks, ES. We currently have HP 45 high capacity or light-user black ink cartridges in stock and available to buy with free next day delivery, provided that you order before the daily cut-off time. To order, simply click on 'Add to basket' followed by 'View basket' and then 'Proceed to checkout' to complete an online order. Alternatively, you can contact our friendly customer service staff to order by phone or ask for further assistance. My printer originally has always used the HP 15 cartridge as it always says that the HP 45 black ink cartridges are not suitable so I'm not sure which ones to buy? We list the black HP 45 cartridges as being compatible with your printer (HP DeskJet 950C). As long as your printer was purchased in the UK then our cartridges should work fine. If your printer wasn't puchased in the UK this may explain why the cartridge numbers you require are different. Able to print up to 11 pages per minute, the HP Deskjet 950c is an incredibly useful printer which creates finely detailed prints. Created with a user friendly design, the Deskjet 950c is extremely easy to use, ensuring that you get great documents without experiencing any hassle. Using the HP Deskjet 950c is so simple that you’ll find you’re constantly using your HP Deskjet 950c for a number of different tasks. Always using your HP Deskjet 950 c can become an issue, however, because the HP Deskjet 950c needs a few HP Deskjet 950c cartridges to work, such as the black HP Deskjet 950c ink cartridge. There are many HP Deskjet 950c suppliers who find that selling the HP Deskjet 950c cartridges at high prices is entirely acceptable because they know you need to replace your HP Deskjet 950c ink in order to get the HP Deskjet 950c to function. You can compare a number of different Deskjet 950 c ink cartridge suppliers to find out- HP Deskjet 950c ink doesn’t come cheap. We at CartridgeSAVE, however, are dedicated to getting you cheap HP Deskjet 950c cartridges for unique discount prices, ensuring that you can use your HP Deskjet 950 c over and over again without paying too much. Getting you the cheap HP Deskjet 950c ink is what we do best and you can’t go wrong with the great service we offer with the HP Deskjet 950c cartridge. We send you your new HP Deskjet 950c ink cartridge by means of free delivery for example, so that you don’t have to pay any extra inconvenient charges. We also know that buying the HP Deskjet 950-c ink without being able to inspect the HP Deskjet 950c cartridge first can be problematic so we have a straightforward money back guarantee policy which allows you to try out your HP Deskjet 950c ink cartridge once you’ve received it, and if you find anything wrong with your HP Deskjet 950c cartridge, you can return the Deskjet 950-c ink cartridge to us for a full refund. If you’re looking for excellent service and amazing discount prices, come to Cartridge Save and have a look at all the HP Deskjet 950-c ink cartridges that we have to offer! The HP Deskjet 950C is a reliable printer with low running costs. It produces high quality photos and texts and uses drop-on-demand thermal inkjet printing and HP PhotoREt III printing technology. This affordable printer is an older model, so compatibility with newer operating systems might become a problem. This grey printer has an easy-to-use control panel, intuitively positioned buttons on the side, and a paper tray at the bottom. The maximum resolution is 2400 x 1200 dpi for photos and 600 x600 dpi for black and white prints. The input capacity of the paper tray is 100 sheets. The HP Deskjet 950C has a 3000-page monthly duty cycle. Users who still use older operating systems will have no problems using the reliable HP Deskjet 950C. The initial and running costs are low, as power and ink consumption is minimal. Yet, the print quality is good. This small printer is suitable for personal or home use as it is small and compact. Though this printer is very reliable and is designed to last a long time, it doesn't run on new operating systems like Lion or Windows Vista. The HP Deskjet 950C does not have networking capabilities, either, making it unsuitable for printer-sharing environments.